(Jacques Derrida, Gift of Death 10). Suicide causes problems for an understanding of the nature of death as Derrida’s words indicate. In medieval legal and religious discourses suicide, the murder of oneself, is active, both a crime and a mortal sin. In the case of the law the suicide’s body might be dishonoured, dragged through the streets, hanged, even tortured, and his or her estate confiscated. In the eyes of the church his or her soul was bound for eternal damnation since suicide usually left no time for repentance. The suicide’s body could not be buried in consecrated ground. It was exiled from the community of those who have (apparently) left their death in God’s hands. There is another discourse to be taken into account, a medical discourse on love as a physical and mental disease akin to melancholy which, at its worst, could cause death. There are links between the different discourses. As Simon Gaunt suggests with reference to troubadour Jaufré Rudel’s amor de lonh or distant love, ‘religion and worldly love inflect each other’.1 The quality of these inflections, the relation between dying for love in these different registers remains a major theme in discussions of courtly love. Song and romance often draw us to the nexus between love and death, as if there is in love itself something deadly. Dying of love, from love or for love is a common topos and in this field its status is highly ambiguous as its different grammatical constructions suggest. This ambiguity has significant ethical implications. In this field, as medievalists have noted, it is often difficult to disentangle suicide from sacrifice or martyrdom.2 It is also difficult to distinguish death as an act from death as passive, a blow to the sufferer delivered by a heartless lover or by Love personified. If dying is considered as a deliberate act then Death as a figure loses his agency. If it is passive then Love and Death are the murderers, conspiring together to bring it about. My paper considers what music brings to these ambiguities, in particular the songs of the trouvères of 12th- and 13th-century Northern France. I will explore what happens to suicide, that most shocking and problematic of deaths, when it is submitted to the metamorphic processes brought about in song, encased in musical and poetic form, the characteristics of different genres and genders and the sound of a singing voice. The trouvère corpus encompasses a complex hierarchy of genres with a range of voices, high and low-style, masculine and feminine, lyric and narrative. Notation is provided for many of the songs. Thus this repertoire offers an opportunity to study love and death in a range of manifestations which further complicate Derrida’s distinctions. 1. Simon Gaunt, in his introduction to Love and Death in Medieval French and Occitan Courtly Literature, uses the troubadour Jaufre Rudel’s topos of amor de lonh to demonstrate how ‘religion and worldly love inflect each other in this poetic discourse’ (Love and Death,1). 2. See for instance Simon Gaunt’s Love and Death, Aranye Fradenburg’s Sacrifice Your Love and Jane Gilbert’s Living Death in Medieval French and English Literature. Jacobus de Ispania (c. 1260-c. 1330), also known as Jacques de Liège, was the author of the influential Speculum musice (1320-30), the largest medieval treatise on music, with 521 chapters ordered into seven books, the last of which considers discant (rhythmicised vocal part music). In this book he constructs a defence of Ars Antiqua musical styles from around 1260-80, as represented by Lambertus and Franco of Cologne and a refutation of the early 14th-century Ars Nova teachings of Jean de Muris and Philippe de Vitry. The terminology associated here with the opposing forces of innovation and tradition is borrowed from Scholastic philosophy where the ars nova referred to the significantly large number of newly translated works of Aristotle available in Paris in the early 13th century and the ars vetus to those few works available to 12th-century scholars. That the concern about the rival merits of old and new became a dominant theme in the years preparatory to humanism is probably associated with Petrarch (1304-74) and linked to the change in historical thinking which revealed an admirable past distinct and discontinuous with the present. The relatively constrained rivalry between the old and new music styles became a global political issue when Pope John XXII, the third of the Avignon popes, issued a decretal Docta sanctorum on the subject in 1325 in which he forbade the use of decorative rhythmic divisions and any other cleverness which might obscure the purity of the melody and the message of the words of chant. Flared nostrils, reddened features, a twisted snarling mouth, wide staring eyes, flying hair (tangled or torn), an overall aspect of monstrosity and wildness: these are some of the common signs by which we might recognise the personification of Anger, in late-medieval visual culture. This hideous face does more than identify the emotion. It tells the reader how to evaluat it by linking it into a network of other negative figures with similar characteristics, from Jews to demons and the tormentors of martyred saints. Yet despite the power and ubiquity of the angry face as a visual image, it is rarely mentioned in written representations of anger. In chronicles and chansons de geste, if the face is mentioned at all, its role in characterising anger is less crucial than other factors: the voice and actions of the character in question, or the response of any other characters nearby. Narrative sources focus on the communicative acts associated with anger and the social changes they produce within the world of the text. I will look more closely at a few key texts to see which aspects of the monstrous angry face resurface, and how they differ in function from their equivalents in visual culture. Myth is in routine discourse taken as the opposite of reality, and much of the study of myth is determinedly distant from contemporaneity. But mythic stories have consistent and consistently changing reference to the socio-political structures of their periods and through reading them in that context we can interpret the emotively understood politics of the contexts in which versions of myths operated. Some of this is straightforward: Arthur represents a splendour which is always transitory, Robin Hood represents resistance to an authority that is felt oppressive. But the transitions and complications within those overarching – and themselves somewhat idealistic - structures can be both surprising and revealing. 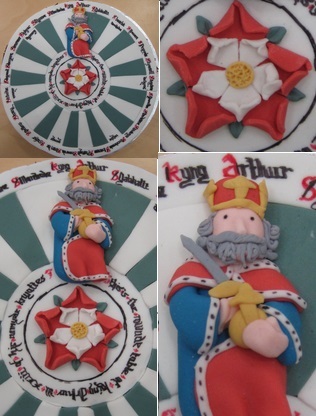 Why is a near-obsessive interest in a historical King Arthur a feature of the 1930s and after? Why does Robin Hood only become a Saxon in 1819? Looking in detail at the functioning and varying politics of well-recorded myths domains can suggest ways of considering, even identifying, little noted changes and repoliticisations of other myths like those of Jeanne d’Arc, Queen Elizabeth I and Shakespeare, three domains which notably activate issues of religion, gender and class. In this summary account of some of the material in a forthcoming book, myths like these which still operate in our culture will be considered, and seen both developing and inter-acting, under the three categories of Power, Resistance and Knowledge. In this talk I will give an outline of the project I am undertaking in association with the Centre for the History of Emotions, examining affect and children’s voices in Middle English narratives. The conceptual framework for the project will be discussed with reference to Jack and His Stepdame, where the irrepressibly upbeat voice of a mistreated "propre lad" is imbued with an inherently puerile ethical rectitude. There is no need to read the poem in advance (although it is quite short), but if you'd like a print-out, or to follow along on a portable device rather than rely on reading passages on Powerpoint at a distance, Jack and His Stepdame is available online. A striking feature of Latin Christendom was its remarkable level of institutional variety, comparable only to that achieved between the rise of the Greek polis and the unification of the Mediterranean littoral by Rome. This paper explores the basis of the institutional variety of Latin Christendom, including interaction between political, commercial and military trade-offs, the doctrines of the Catholic Church regarding ethics, law and family structure, and the geography of Europe and how this combination of factors led to the development of not only an intensely competitive, but also a distinctively diverse, state system. This process of competition, among states much more varied in their political structures than in other civilisations, provided the processes of historical selection had far more institutional variety to work through, resulting in the evolution of much more capable states, able to create and manage globe-spanning empires. Drinks and celebrations, with a short talk by Professor Stephen Knight. Afterwards we will go out to dinner in Carlton at our own expense, at a venue that does reasonably-priced set menus. Further details and a request for RSVPs closer to the date. Most mythic study is consolingly distant from modernity – Aztec, Babylonian, Classical Greek. But there are myths that reach into the present, operating from the early middle ages on. They have, and still have consistent relations to their sociopolitical contexts. This appears in two striking but underconsidered ways. In their originary and developmental periods these still potent myths had a striking variety of forms and meanings, relating to their formative and communicative contexts; and their meaningful variations continue to the present. So it is possible to read such myths and their variations in reverse as indicators of the issues that concerned varying periods and contexts. These topics are dealt with in The Politics of Myth: from King Arthur to Ned Kelly, Melbourne University Press, forthcoming 2015. This short talk will give a selective and illustrated account of the major patterns to be observed in five medieval myths that have all been realised in twenty-first century film and television. They, like the others in the book, are considered in functionally thematic terms -- Power: Arthur, Guinevere; Resistance: Robin Hood, Jeanne d’Arc; Knowledge: Myrddin/Merlin. This paper is a section from the preface to my doctoral thesis, in progress at Monash University being prepared for publication in the Academic Gazette in Riga, Latvia. As a prelude to the main body of the thesis, this chapter presents a broad outline of the historical and cultural preconditions that set the mood for medievalism and romanticism in Livonia as precursors to Gothic Revival. It will identify the medievalist impulse in a period of crucial importance in the history of Livonia and establish the psychological and intellectual driving forces that sustained its growth by a study of the cultural landscape. The Sherborne Missal (British Library Add. MS 74236) was created for the Benedictine Abbey at Sherborne in England in the early fifteenth century and is considered to be one of the most spectacular service books to survive from the Middle Ages. Executed on a grand scale, it includes some of the finest decorative micro-architectural illuminations of the period. This talk will consider the status given to the architectonic devices in the Missal and what the prominence of these architectural motifs were intended to convey, considering whether contemporary models were used as a basis for these illustrations by the chief illuminator, Dominican friar John Siferwas. Susanne has recently completed an MA in History of Art at The Courtauld Institute of Art, specialising in European art and architecture of the Gothic period. Prior to The Courtauld, she graduated from the University of St Andrews with Joint Honours in English and Art History. White is achromatic – a colour without colour – in scientific terms and in Western culture which is eager to declare itself post-racial but equally eager to remain normatively White. The contemporary popular imagination sees the Middle Ages as a pre-race utopia, before the invention of race as a concept, but simultaneously as a time when race – specifically the White race, whatever that term means in any give context – was fundamentally and authentically real. Medievalism emerges as a prominent paradigm of post-medieval cultures in periods of significant anxiety about racial identity: in the mid-to-late eighteenth century as scientific theories of racial difference developed; at the height of European imperialism and American expansion in the nineteenth century; in the 1970s following the Civil Rights era; and post-9/11. This paper traces connections between Anglophone concepts of Whiteness (race) and ‘the medieval’ (culture) from the eighteenth century to the present to argue that White ethnicity has been focused on the Middle Ages as originary crucible for centuries. It begins with a discussion of Thomas Percy’s Reliques of Ancient English Poetry (1765) and Northern Antiquities (1770) and traverses the centuries to Tony Abbott’s June 2015 speech celebrating the 800th anniversary of the signing of Magna Carta, drawing on Sara Ahmed’s concept of ‘happy history’ to argue that distinctively racialised forms of nostalgia came be discerned across some 250 years of Western culture. By this peynture may ageyn him fynde. This paper will discuss what it means to forget and remember a face — and a person — in the middle ages, with special reference to this passage from Hoccleve’s text and the fate of this early image of Chaucer (and perhaps some others). It will also consider the question of copying and reduplicating images of individual faces in an era of manuscript reproduction. For the image in question, see the The Hoccleve Portrait of Chaucer web page. And for the full text of the Regiment, though I won’t be discussing it in detail, see the Thomas Hoccleve, The Regiment of Princes web page.